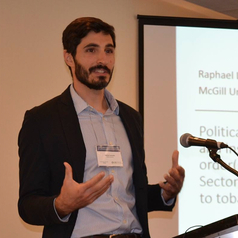 Raphael's principal area of research focuses on global health governance and the political economy of public health policy. He has conducted research on the development and negotiation of the first global public health treaty negotiated under the auspices of the World Health Organization, the Framework Convention on Tobacco Control (FCTC). His research focuses on the challenges of intersectoral governance for tobacco control in Brazil, Philippines, Kenya, Malawi, and Zambia. This research examines institutional design, intersectoral and multilevel governance and how these governance factors shape the control of products that pose risk for non-communicable disease. His other line of research explores mental health policy at the intersection of experience, ideas and institutions. His work has appeared in the Lancet, Health Policy and Planning, the Journal of Public Health Policy, the Journal of Health Politics Policy and Law, Globalization and Health, Global Health Governance among others.